Combine 1 1/2 cups warm water, sugar, and 2 teaspoons of the kosher salt in mixer bowl. Sprinkle yeast over water and let sit 5 minutes. Meanwhile, melt 4 tablespoons of the butter, and let cool slightly. Add butter to water. Add flour, one cup at a time. After all flour is combined, attach dough hook to mixer and knead for about 5 minutes. Remove dough, grease bowl, return dough to bowl, cover with plastic wrap and let rise for 1 hour. Preheat oven to 450 degrees. Line cookie sheets with parchment paper rubbed with just a bit of oil. Bring 10 cups water and baking soda to a rolling boil. Separate dough into eight pieces. Roll each piece into an 18 inch rope. Twist rope into a pretzel shape. 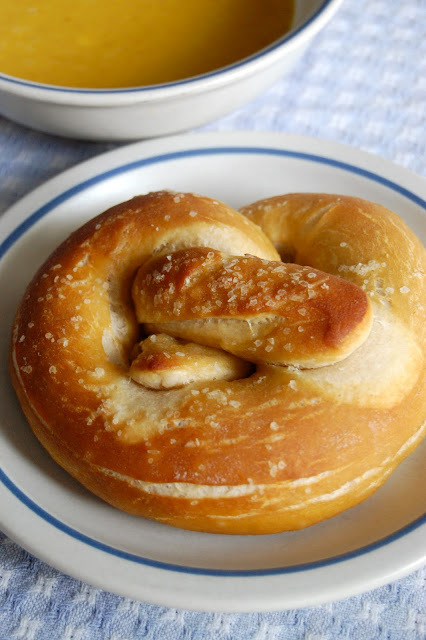 Drop each pretzel, one at a time, into boiling water for 30 seconds. Place pretzels onto prepared cookie sheets. Whisk egg yolk with 1 tablespoon of water and brush onto pretzels. Soften the rest of the butter and rub half of it onto the pretzels. Sprinkle with the rest of the kosher salt. Bake pretzels for 15 minutes. Halfway through baking time, rub remaining butter onto pretzels. Let pretzels rest 5 minutes after removing from oven. Serve warm with choice of dipping sauce and enjoy!